Courtesy of Kachan & Co. But the biggest reason—that we've written about for some time here, here and here—is that venture funds' Limited Partner investors have been underwhelmed (some used the term 'burned') by cleantech too much for too long, and the term is now poisonous for some venture partners; some are distancing themselves from it. Some have let go of their teams. So while there may still be relatively wide general industry momentum for the term cleantech, because lexicons don't change overnight, those at the very center of the space that we've thought of as cleantech are quietly starting to use other phrases. Deloitte, for instance, rebranded its annual invitation-only Napa Valley cleantech event last week as Energy Tech. Is it just a matter of time until others start picking similar monikers? 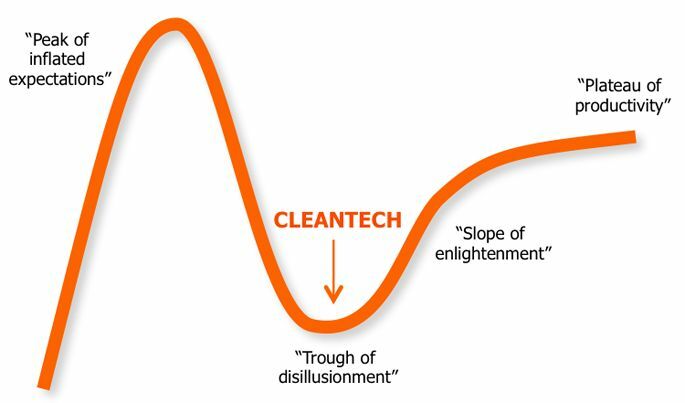 Will cleantech re-emerge, regain in popularity and follow the Gartner curve back up? Or has its usefulness as a distinction ended? If the term is no longer fashionable, what should this space be called? What would you advise entrepreneurs in this sector to position around? We`re very interested in your thoughts here at Kachan & Co., where we work exclusively with cleantech companies... or what we used to call cleantech companies! Leave a comment below. A former managing director of the Cleantech Group, Dallas Kachan is now managing partner of Kachan & Co., a cleantech research and advisory firm that does business worldwide from San Francisco, Toronto and Vancouver. The company publishes research on clean technology companies and future trends, offers consulting services to large corporations, governments, service providers and cleantech vendors, and connects cleantech companies with investors through its Hello Cleantech programs. Kachan staff have been covering, publishing about and helping propel clean technology since 2006. Details at www.kachan.com. No comments were found for Cleantech by any other name. Be the first to comment!